When it comes to renovating your home, trust the experts. After all, that roof is over your head and your family’s and you want it to be safe. Every well-built house is initially built with a solid and level foundation. It should have true structural and load-bearing walls that are accurately placed. Over time, that house might be renovated a few times here and there, where certain walls, joists, and beams are taken out. You might not realize at first that this can lead to many issues and can compromise the structure. 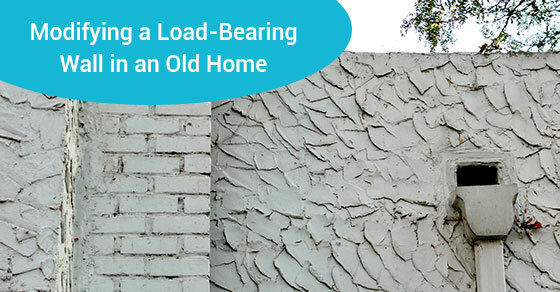 Some might think one wall can handle a heavier load when it can’t, and you might end up with cracks in the plaster, windows and doors that stick, and buckling drywall. Your house might even start leaning, with floors that slope, or it may even collapse. Incorrectly renovating your house without understanding the layout structure of your home can be detrimental. Many people want to save money and renovate their homes on their own rather than hiring a contractor, architect, or structural engineer. This can lead to even more work than they initially started with and can damage the structure of their home. Only professionals will know which walls are structural and which are safe to take down. One should always consider hiring a professional if they want to take down walls to create an open-concept floor plan. Most older houses have a solid structural layout that is quite simple. The exterior walls are usually the load-bearing walls and support the perimeter, while a beam supported by posts that you can see in the basement runs down the middle of the house, and the joists all run in the same direction from side to side. The walls that are directly above the beam in the basement are usually load-bearing walls as well. During the construction of some old homes, the load was taken straight down to the footing at the base of the foundation wall. Although older homes were built more strategically, it doesn’t mean that your home will have a solid structure just because its older. You have to know exactly where the structural components of your house stand before you go forward with a major renovation. So, if you have any renovation plans that will affect the structural integrity of your home, you should definitely consider getting an assessment. Ensure that it is a proper professional doing the structural assessment, such as a qualified engineer. The money you spend on the assessment is money saved rather than spending thousands on repairing a home that is collapsing. Not only will you save money, but hiring a professional will give you a sense of security, knowing that your house is stable and strong. Heritage homes are beautiful, but can be tricky to renovate if you don’t know what needs to be done. Avonlea Kitchen and Bathroom Concepts is a company that specializes in the design and construction of beautiful kitchens and bathrooms in the old homes of Toronto, as well as home renovations. To learn more about Avonlea Renovations, contact them at (416)-907-4764 or here.